The Internet browser of the system is our gateway to information and entertainment from across the world. Unfortunately, many of us do not take care of it. Over time, because of poor maintenance it starts to lag and slow down. This ultimately results in slow down of browsing speed and a ruined browsing experience. What Causes Browser to Slow Down? There can be many reasons for a slow Internet browser. One of the prominent reason is an obsolete and outdated browser. Second, if you clutter the browser with add-ons, history and various settings it will start to lag. Most of us have a tendency to install add-ons as per requirements but with passage of time forget to remove or disable them when not required anymore. 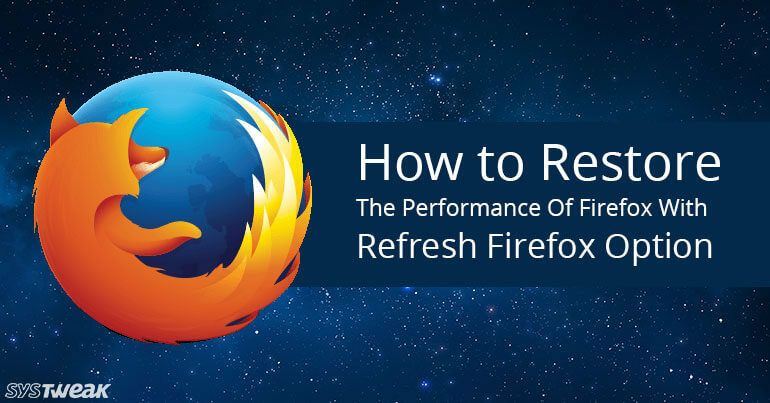 To come out of this situation Firefox provides the option of Refresh Firefox, which not only restores the performance but also fixes many problems. To start with, if you are worried about your saved passwords and bookmarks, then please be assured that it does not delete them. Moreover, if you use this Refresh feature while you are in the middle of something i.e. you have opened various tabs, it will prompt you to reopen the tabs after the Refresh or not. However, this option will clear all the browser history and cache, along with resetting your browser settings to default. Also, this will remove all add-ons installed and their data. This process just takes few minutes and a few simple steps. Click on the menu button (3 horizontal lines) located at the top right corner of the Firefox window. Now from the drop-down menu click on the “Help” option. In the help menu click on “Troubleshooting Information” option. Now click the “Refresh Firefox” button located at the top right corner of the Troubleshooting Information page. A warning message will be displayed which will indicate that this feature will remove your browser add-ons and customizations. Also, it will revert the browser settings to their default settings. Click “Refresh Firefox” to confirm. Now Firefox will reopen after clearing all your obsolete data along with add-ons. It will then ask you to restore all your tabs and windows or some specific ones. Select the option as per requirement and click on Let’s go! You will now find that all your history, cache and add-ons are removed. Also, all the settings which you formerly made are now reset to the default. You can at anytime refresh Firefox if you are finding trouble in browsing. Hope your browsing experience improves after following these simple steps.